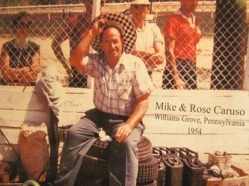 This website is dedicated to the memory of Mike and Rose Caruso for their love and contribution to automobile racing. Mike Caruso was born March 4, 1899 in San Pedro, Italy. He came to the United States with his parents, the following year. When his father died 1912 he was forced to quit school and help support his mother. With only a sixth grade education behind him and a natural mechanical ability, Mike went to work in a Brooklyn auto garage and quickly became an excellent mechanic. The first automobile race Mike Caruso saw was one held at the Sheepshead Bay, Long Island board track in 1916. Although offered an opportunity to become a riding mechanic for one of the race car owners, he did not because his mother was against it. The first “race car” Mike constructed was made from a world record Excelsior V twin 61 C.I. motorcycle engine which was the first to exceed one hundred miles per hour by Lee Humistor on a board track at Playa del Rey in California in 1912. Mike mounted the motorcycle engine on a make-shift car and although this car never actually competed in an auto race, it was a unique vehicle. With only his shoe heels for brakes, young Caruso and a friend, would drive to Coney Island and once tried to compete against police motorcycle racers who refused to compete with this four wheel vehicle. Caruso and a friend are said to have mounted an airplane propeller on the engine and got it up to 45 MPH before being stopped by an old Brooklyn cop who was not amused.